April 24th is the last stock date for the season. 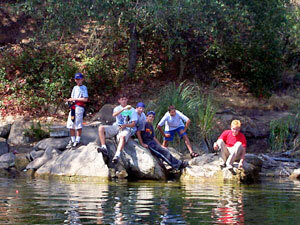 Dixon Lake will be closed for fishing on April 24th, 25th, and 26th. Rangers will be out enforcing the closure. We will reopen at 6am on Saturday April 27th for the 2-day Hidden Valley Kiwanis Trout Derby. There will be lots of fun and prizes for this derby. Remember everyone who is fishing will be entered into the derby and lake permit prices are $14 for adults, $10 for children and seniors. There will be a "kiddie pond" for children under the age of 8. Hours for the Derby will be 6:00am until 6:00pm on Saturday and 6:00am to 4:00pm on Sunday. All fish must be weighed in before the Derby closes to be counted. Full fishing rules will be in effect. A California fishing license is not required to fish at Dixon Lake, but you must purchase a daily fishing permit each day from the concession stand before you start to fish. ATTENTION: In order to protect Lake Dixon from invasive exotic Quagga mussels, there is still a ban on private water craft and equipment that could have been exposed to mussels. Restricted equipment includes private boats, canoes, kayaks, float tubes, trolling motors, fish finders, anchors and other equipment that contacts the water. There is no body contact allowed with the waters of Dixon Lake at any time. Remember, consuming alcohol and smoking are prohibited at all times in day use areas, on the shore or on boats. Violations of this rule will result in ejection from the park. Dates are still undecided for the 2019 Hidden Valley Kiwanis Foundation Charity Trout Derby, but keep watching this page for updates. * Any fish caught are counted against the limit of the accompanying permit holder. ** Deposit is required. See rental counter for boating rules and regulations.